UPDATE: The ban was passed into law by the Parliament of Catalonia on the 28 July 2010, coming into full effect in 2012. The final vote was 68 for the ban, 55 against, with nine abstaining. On 28 October, the conservative nationalist, People’s Party lodged an appeal with the Spanish Constitutional Court on the grounds that the regional parliament has exceeded its powers in banning a practice of national cultural significance. For more detail, see our posts here and here. 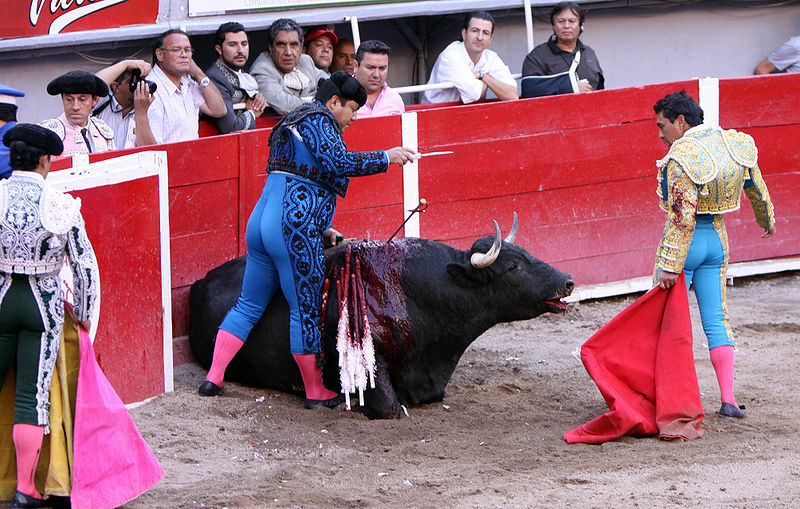 Bullfighting afficianados have been treated to some spectacularly gory action in 2010. In Spain, in a widely-publicised incident in May, bullfighter Julio Aparicio’s jaw and lower throat were pierced by a bull’s horn which emerged from his mouth. Only one month earlier, Spain’s most charismatic and popular bullfighter, José Tomás, suffered a severe goring in Mexico which required a transfusion of eight litres of blood. The human body normally contains five litres. But despite the inherent risks, only fifty-two toreadors have died in the ring since 1700. Even more recently (13 June 2010) tragedy was echoed as farce when Mexican ‘novillero’ (novice), Christian Hernandez, turned tail and fled the arena [the video at this link really is worth watching] when, after failing to kill his first bull in the allotted time, he dived over the barrier headfirst to escape the second. This is not without precedent. In 1847, José de los Santos fled in fear of a bull in the Valencia ring, leapt over the fence and impaled himself on his own sword. Hernandez’s reward for what many would consider an entirely sensible decision was to be arrested and taken to the local police station for ‘breach of contract’. In a common law country it seems bizarre that someone should be arrested and treated as a suspected criminal for a civil matter but in Mexico it is not irregular. He was released after the payment of a fine and has since announced his retirement from bullfighting. These recent reversals of the usual odds, along with an increasingly vocal and organised protest movement, have intensified a national debate in Spain that has split the country along regional lines between those arguing for the abolition of this ritualised slaughter of bulls and those declaring the bullfight a protected cultural treasure, offering government grants and tax cuts to its promoters. This is an issue charged with political significance as the Catalan region is home to many separatist movements, with bullfighting viewed as emblematic of Spanish colonial culture by both sides. On 18 December 2009, the parliament of Catalonia approved by 67 votes to 59, the preparation of a law to ban bullfighting in the region, initiated in response to a petition signed by 180,000 people calling for it to be banished from the region. The passage of that law is now being debated and the final vote to pass it into law will be cast within the next two months. They have been conserved as a breed precisely because of their bravery … The only use they have is exactly the one for which they have been bred. For the females, this is done by taunting the cow with a red cape, which they charge at. Males however aren’t tested with a cape because when they see the cape in the plaza it must be for the first time. Males instead have to charge against a big horse protected with a thick cover and themselves get jabbed in the back to provoke anger, which causes some blood loss. It is an art-form that deserves to be protected and that has been part of Mediterranean and Spanish culture since time immemorial. This issue also has a high legislative profile within Catalonia where, at the same time the ban is debated, the parliament is also passing measures to protect the correbous, a regional tradition in which burning torches are attached to bulls’ horns and they are sent to run through the streets. The associated practices are extremely cruel. Former bullfighters tell of bulls being intentionally debilitated with tranquillisers and laxatives, beatings to the kidneys, petroleum jelly rubbed into their eyes to blur vision, heavy weights hung around their neck for weeks before the fight, and confinement in darkness for hours before being released into the bright arena. Ninety percent of bulls killed in fights have their horns ‘shaved’ before the fight. Horn shaving involves sawing inches off the horns so that the bull cannot properly judge where they will strike. The killing is highly ritualised. First, the toreador‘s assistants wave large purple capes at the bull to see how it reacts and moves in the bullring. The colour of the cloth actually makes no difference as bulls are colour blind; they go for the cloth because it is a large moving target. Next, two picadores (lancers on horseback) enter the arena with the objective of piercing the neck of the bull to weaken its neck muscles. The horses ridden by the picadores are used as fodder and tend to be old plough horses. They are often drugged and blindfolded, have wet newspaper stuffed in their ears to impair their hearing, and there have been documented cases of their vocal cords being cut so that their cries do not distract the crowd. 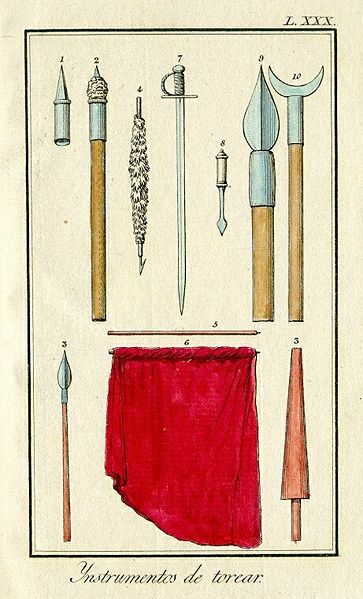 With this done, three banderilleros take turns stabbing banderillas (small spears with barbed metal tips) into the bull’s neck. 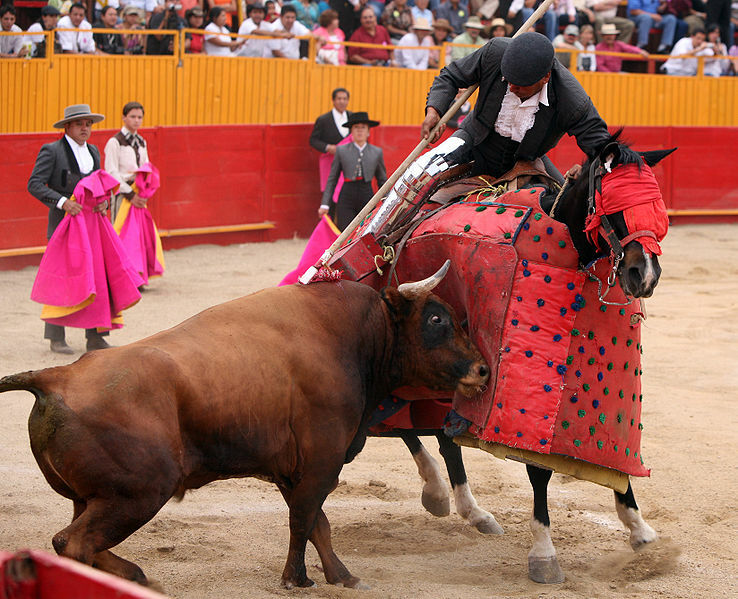 Now the bull is significantly weakened from loss of blood as well as its pre-fight trauma and the toreador then attempts to deliver the coup de grâce by drawing a sword and driving it between the neck vertebrae and into the heart. This requires great accuracy and the toreador will usually make several painful attempts, puncturing the lungs with the sword emerging through the ribcage, before successfully piercing the heart. This rarely kills the bull outright but he will bleed to death in front of a cheering crowd within the next few minutes. 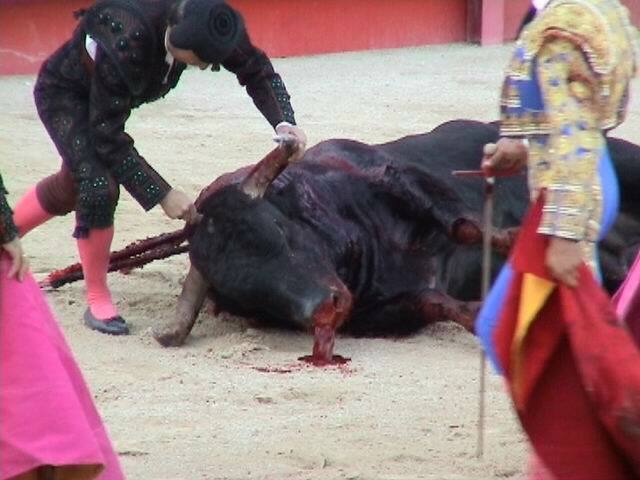 If he is slower in dying, the full team of bullfighters will move in and stab him until he stops moving. If the kill is ‘clean’, (that is, less agonisingly prolonged than is usual) the matador is rewarded by popular acclaim. A judge will then decide the reward which is comprised of grisly tokens taken from the bull; one ear is good, two ears is better. The ultimate accolade, rarely given, is an award of two ears and the tail. These trophies are cut off the bull as he lies on the sand, often paralysed but not yet dead. Bullfighting is a celebrity culture which places matadors on the same social scale as pop singers and movie stars. This has culminated in such spectacles as a record-seeking exploit to see a 16 year-old, ‘child-prodigy‘ of the ‘art,’ Jairo Miguel Sánchez, be the youngest-ever person to slaughter 6 bulls in an afternoon. Jairo’s life has been spent in pursuit of this goal. [B]een fighting professionally since he was 12 and … first sank a sword into a living animal when he was eight. Jairo Miguel has been one of the most controversial figures in bullfighting since, at the age of 10, he fought and killed a young bull. He was also gored twice: the first time, when he was 14, he was left with two cracked ribs. A second goring saw a bull’s horn brush his aorta, puncture a lung and penetrate to within an inch of his heart. Spain refuses to license bullfighters before they are 16 and Jairo’s early exploits attracted some significant fines. So Jairo’s former-bullfighter father, Antonio Sánchez, took his 11-year-old son to Latin America to pursue a career as a professional. Bullfighting resulting in the death of the animal is practiced in only ten countries in the world: Spain (except in the Canary Islands where it has been banned since 1991), France, Panama, Portugal, Peru, Ecuador, Bolivia, Venezuela, Guatemala, and Mexico (where there is no age limit for toreadors). A ‘bloodless’ form is legal in the state of California, USA. Cultural traditions are, as a general rule, worth protecting. But a reconciliation with the rights of animals to be free from cruel treatment is urgently required when this preservation allows such anachronisms as the public ritual torture of a sentient being to be passed off as sport and allows conduct that would be completely impermissible under the animal welfare law of the very same country. Although, Spanish animal law varies widely between regions. In Andalucia, there is no law whatsoever prohibiting cruelty to domestic animals but agricultural animals are protected from cruelty throughout Spain by European Union law. It is even more anomalous that Spain should lead the world with federal legislation guaranteeing ‘Great Apes’ (chimpanzees, orang-utans, gorillas and bonobos) a right to life, freedom, and protection from experimentation and torture. But then, there was no known animal experimentation involving great apes being conducted when the law was passed and it certainly did not have a highly-lucrative industry built around it as is the case with bullfighting. Pedimos disculpas por la demora. Pruebe http://translate.google.com/#en. at least the bull has a chance to fight back unlike the ones the ones whose parts you see in steaks and hamburgers. So much for fair chase with your rifle or bow – now is the time to do it with a sword, even on horseback, might drain you of all that adrenaline. Seriously now, there are those who like to hunt, those who wish to watch bullfights, horse fights or cockfights. every country and every culture has its own. Le us make our campaign universal and beyond reproach; stop all activities that require the death of an animal. Keep to dairy and vegetables on your table, hang that bow and stow away that rifle. Cut down on the steak and on those cuts – let us be truly kind to animals and to ourselves. We become more human, and we delay climate change by doing so.